Making your own trail mix can save on cost and ensure that you make a healthy choice for snacking! My coworker asked me the other day if I had any tips on healthier eating and the first thing I thought of was good snacks! Skipping meals is terrible for your body and only means a higher chance of you over-eating at your next meal. However, if you snack in-between then your metabolism is continually working. The key is to make sure you are snacking properly. 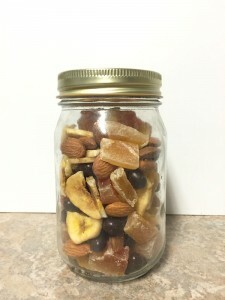 I am all about homemade trail mix! There are so many different variations, and as long as you are putting it together yourself then you can make sure you choose healthy combinations. 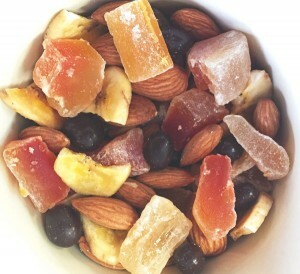 One that I love is a few different types of dried fruits combined with some extra yummies to keep it interesting. For this particular trail mix I chose dried papaya, mango and pineapple, along with almonds, banana chips and chocolate covered pomegranates. The final outcome is a sweet snack that is chewy and crunchy. The natural sugar in the fruit is a great pick-me up! I usually put this together in bulk and have it all week to nibble on. I like to take mine in a travel container to work. A bag would work too, but I’m sure many of you understand my obsession with mason jars…. #Snacking right is a #healthy way to keep your #metabolism going inbetween meals! The key to putting these type of mixes together is to just hit up the section at the grocery store where you can get bags of different nuts and other various items, then put it all together in different assortments at home. Another that I love to make can be viewed here.